I have some exciting news! 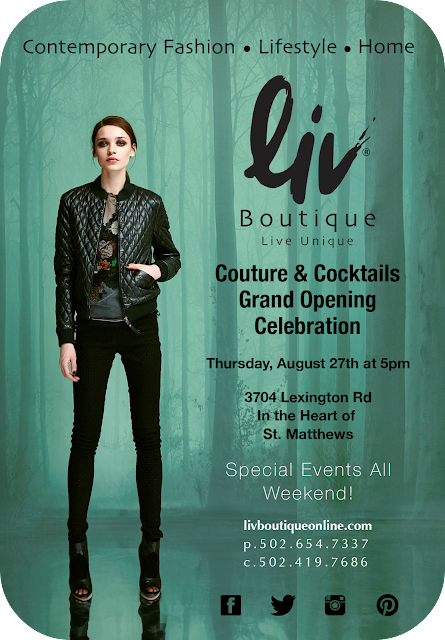 A new lifestyle boutique is opening up in St. Matthews (perfect time to start your fall shopping!). This new lifestyle boutique will have a focus on fashion, beauty & home. According to the press release I received, they will "feature fashion from talented emerging designers around the world, as well as high end beauty and home products." "In addition to lines by established designers like Bella Dahl, Fifteen Twenty, Chaser, Nicole Miller, Young Fabulous and Broke and Current Elliott, Liv Boutique will feature the work of emerging designers like Amy Matto, Waverly Grey, Mattison Stone, Tangerine Silks, Charli of London, Maya Negri, Yumi Kim and Karina Grimaldi. The store will also carry beauty products from Glo Minerals, EuroParfumes, Jao organics and Tokyo Milk as well as accessories from Linea Pelle, Lauren Merkin, Tribeca and Gels eye wear. For the home, customers can find not only one-of-a kind art and antique selections but also an array of gift items at the shop." I'm *really* excited for the beauty products. I took a peek at Tokyo Milk's website, and I can't wait to see what Liv Boutique will be carrying from their line! Their Grand Opening is on August 27th @ 5pm! Can't wait to see you there! Interested in seeing updates on events going around Louisville? Don't forget to download our new App for BourbonBeauty!